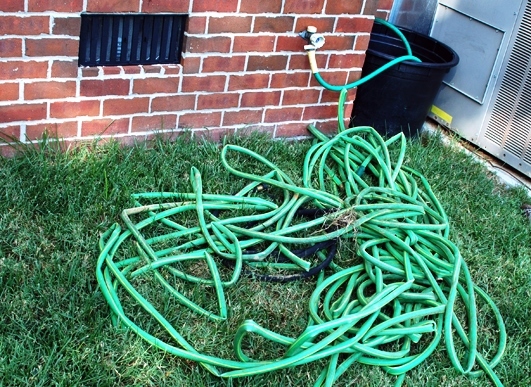 So for just as long as we’ve had garden hoses to tangle, we’ve been thinking up ways to keep hoses neat and tidy so you don’t trip over them or run them over with the lawn mower. And wouldn’t you know it, many of them are sized at five gallons. The simplest garden hose holder is just curling up your hose into a 5 gallon bucket. What used to lay spread eagle over half the back yard is now neatly contained in under one square foot. And as a side benefit – you can now easily carry your hose bucket around – like say from the front yard to the back yard. 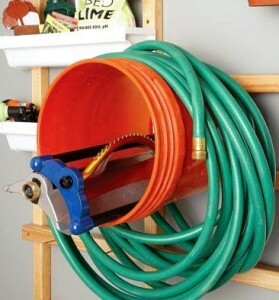 I think this is my favorite way to organize a hose using a bucket. 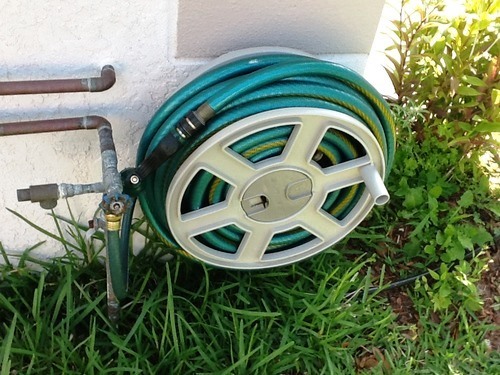 By mounting on a wall, you can loop your hose around just as you would with these metal hook hose holders you can get. Although you can’t lug it all around anymore, it’s now a perfect little bucket shelf. Use the shelf for gardening tools, gloves – or you could stuff a sprinkler in there! For the hose jockey with too much hose and too little time, there’s the crank-powered hose reel. 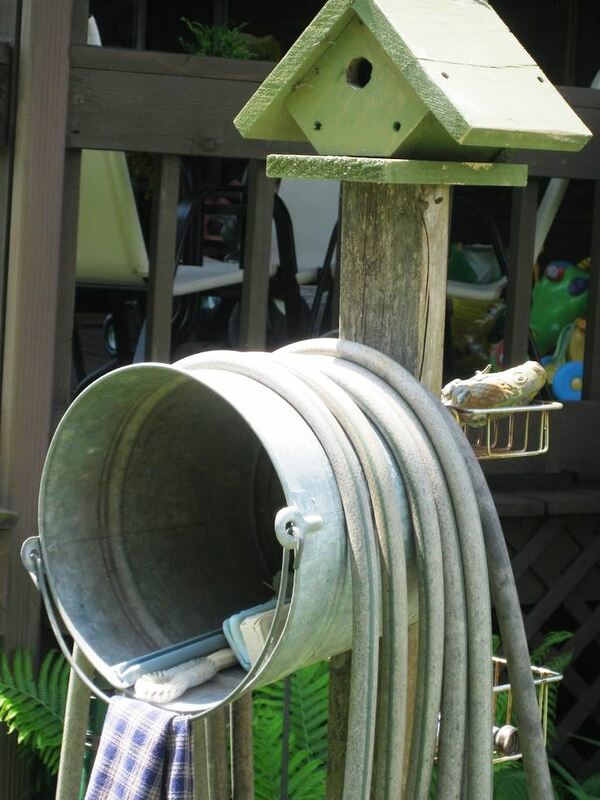 Yes, they DO make cable reels that fit in 5 gallon buckets, but they don’t work well for garden hose, since a hose likes a little more elbow room than the central column on these will allow. They might work for flat hoses though. Go a little bigger however, and you cannot beat the speed with which you can reel hose up. This is the Suncast 100 foot hose reel, one of the most popular models of hose reels available on Amazon. 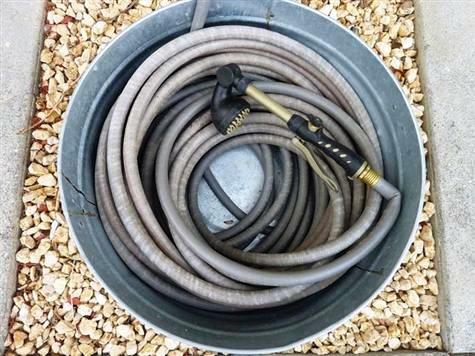 Although a bucket may be small for a garden hose, it’s the perfect size for tons of electrical cord. But that’s another post for another day, writing this article has reminded me that I’ve got to go switch the sprinkler system on. do you have a spare car wheel (without tire ofc)?